Heather's Perfect Posts: Happy Birthday, America! America's birthday is on July 4th which is Independence Day in America! 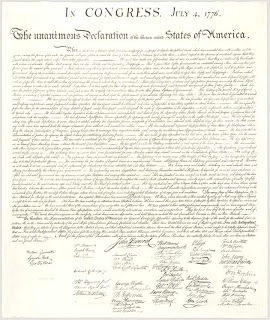 On July 4th, 1776, the Declaration of Independence was adopted by the Continental Congress in Philadelphia, Pennsylvania. This document was announced America's independence from the Kingdom of Great Britain. Independence Day is commonly celebrated with fireworks, parades, barbecues, carnivals, fairs, picnics, concerts, baseball games, family reunions, political speeches, and ceremonies. Last year and the year before, I celebrated July 4th with a nice barbecue with some of my relatives and the fireworks from a school with my neighbors. This year, I will not be having another barbecue and I will always be watching the fireworks as long as I don't move. Instead, I celebrated by going to a splash party and got a sparkly dog tattoo. It was all very fun and exciting! There were stands that you could win prizes and I got three of them. I also got a bow n arrow balloon. I did not get any photo of the fireworks because I could not get a quick shot of the fireworks. Nether did my mom because the fireworks were appearing and disappearing every time we tried to get a shot. "I pledge of allegiance to the Flag of the United states of America, and to the Republic for which it stands, one Nation under God, indivisible, with liberty and justice for all." The flag should never be hung upside down unless there is a signal of dire distress in instances of extreme danger to life or propriety. Do not use a flag as a target. Happy 4th of July! I liked that your post had so many good facts. We celebrated the same way you did. We also went to a splash party in the afternoon and then watched the fireworks at a barbeque party in the evening. This is one of my favorite holiday and one I look forward to every year. What else do you have planned this summer? Our fireworks were launched from the high school near us and went down to my neighbor's house to watch. Where did you watch your fireworks? Yes, I do have a plan to visit Hawaii in August. I will be spending eight days at an island called Oahu. Do you have any other places that you are going to this summer? My favorite "holiday" is summer and I love summer because you could go in the pool and swim. I also enjoy summer because we don't have any school!